We’d love your help. Let us know what’s wrong with this preview of From An-Other Land by Tanushree Ghosh. But what is immigration today? A question of life or death - fleeing of persecution? A compulsion? Or a me Never has been the conversation on immigration more pertinent than now, post 2016 US elections. From cancellation of refugee protection and zero tolerance to undercurrent crackdown on H visas, the resurgence of nationalism is hitting the globalized population head-on. To ask other readers questions about From An-Other Land, please sign up. 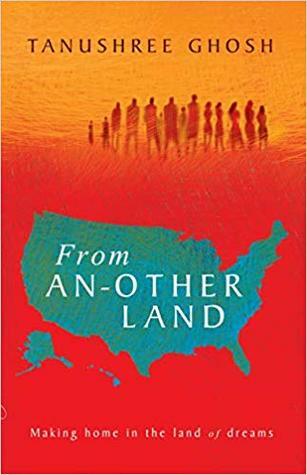 I was delighted to be offered a review copy of From An-Other Land because I felt this short story collection might offer alternative perspectives on the immigration experience. That is absolutely the case! I loved that Ghosh portrays a wide variety of authentic characters who each undertake their journeys to America for very different reasons. I had previously understood people emigrating to achieve their own dreams, but it must be even more of an emotional mountain to climb when you are following someone else's life plan. I am not addressing you, the readers, but remembering the iconic sitcom from where many of us got our images of life in the USA. This and other TV shows and books, of course, have been our window to the American way of life. “From An-Other Land” by Tanushree Ghosh brings to us a view from another window---- through the eyes of Indian immigrants to the Land of Oppportunity. Laced with understated humour, this book of short stories throws up the complex dynamics of relationships, between p Friends! Laced with understated humour, this book of short stories throws up the complex dynamics of relationships, between people and between people and the country they have chosen as their own. The story of Tarun and Michelle slowly and poignantly unravels, as the complicated emotions of Michelle lead us to wonder about Tarun, “Will he, won’t he?” Then there is the unusual tale of a woman who marries her brother-in-law for a green card, not only for herself but for her husband as well! The author puts a lot of thought into the naming of her characters. For example, the sisters Asti and Tiyash are named like inverses of each other, and their personalities are opposite too. The characters are introspective. Tanushree showcases the dichotomy that immigrants must deal with---- their Indian heritage and their American sensibilities. A perfectly harmless question in India may be construed as an intrusion in America. A couple of stories also bring up the other point of view--- that of American citizens who feel insecure about Indians taking away their jobs. Yet, through this insecurity, an empathy prevails, with both sides realising that the other is human too. In many of the stories, the underlying theme is loneliness, yet the human spirit also shines through. Instead of plunging straightaway into the stories, the author has cleverly introduced her characters in the first story, as people in line for Immigration. As we go through the book, we are compelled to turn back to the first story, just to see where each character comes from, in terms of their mental state, and their aspirations. The author is an observer and she gently brings to life the myriad characters that people this book. Every once in a while, I NEED to read a book like this. I need to read a book that bursts my happy little bubble. That pushes me outside of my comfort zone and into the real world, where things beyond toddler temper tantrums are happening. A world where greatness exists alongside unimaginable fear and pain. The reality of the lives of people trying to immigrate to this country is stark. I can't begin to enumerate the lists of things I learned about immigration and the lives of Indian immigrants from this book. I particularly loved the style of writing from this book. From the introduction if the characters in a particularly unique form, to the way each chapter sets out the focus of each journey, this book is thought provoking and beautiful. The prose are strikingly honest and challenging while at times humorous. I also truly enjoyed how much I learned about human nature and myself while reading From An-other Land. In one chapter, a character is discussing difficult conditions and conveniences and how adaptable we become to them. "But once not needed, such skills [to deal with difficulties] were forgotten rendering people helpless to much lesser obstacles." That just hit me. I am constantly consumed with the worries of my life, even though all of my vital needs are easily taken care of. How truly I can relate to this. I am so used to my conveniences, even ones that I wasn't born with, that I would be unable to function without them. This is a quick read, but I would not call it easy. It's beautiful, but way too real to be easy. There is no comfort offered in these pages, except the comfort of an occasional laugh and of getting a different perspective on life. I am so happy to have read this book and will be recommending it to all of my friends. * Special thanks to Tanushree Ghosh, Readomania Publishing, and iRead Book Tours for providing a copy of Glory Road in exchange for an honest review. The first thing that caught my attention was the Author’s Note. It was one of the best written introductions that I have come across. Once I started reading the book, I found it a bit depressing initially. It seemed as if all the stories were sad ones. I even put the book down to go and do something happier. But then I can never stop reading a book half way and so I was back. And am I glad I picked up the book again. Because the rest of the afternoon transported me to a different world. The weird thing is that Ms.Ghosh has written the stories with barely two or three lines of direct speech and yet the stories are compelling. She had managed to get into the head of all the varied characters and create a wonderful mosaic. Each story is different, yet they are knitted together by the first and last chapter and that gives a very satisfying finish to the book. "From Another Land" is a marvelous book. Ms. Ghosh's writing cuts to the core of each character - I felt like I knew each and every one. Ms. Ghosh has the unique ability to discuss an enormous, world-sweeping issue through the lens of individual lives, which is, of course, where issues play out, and where we find compassion, wisdom, and understanding. Her writing has a shimmery, urgent quality that makes each character feel so real and knowable. I can't wait to read more of her writing. Ghosh Tells Eternal Truths About Immigration. Tanushree Ghosh’s FROM AN-OTHER LAND unabashedly challenges our notions of personal and cultural identity, with characters who seek to define themselves in an intercultural setting that is less and less sure of itself. Ghosh isn’t afraid to poke her characters with a stick to see what they’re truly made of. From a family man who succumbs to the forbidden temptations of white-water rafting, to a woman torn between preservation of self and the confines Ghosh Tells Eternal Truths About Immigration. Tanushree Ghosh’s FROM AN-OTHER LAND unabashedly challenges our notions of personal and cultural identity, with characters who seek to define themselves in an intercultural setting that is less and less sure of itself. Ghosh isn’t afraid to poke her characters with a stick to see what they’re truly made of. From a family man who succumbs to the forbidden temptations of white-water rafting, to a woman torn between preservation of self and the confines of old-world traditions, to a pair of lovers thwarted by cultural divides, Ghosh’s stories are alternatingly hilarious and heartbreaking—and undeniably relevant.